SATSUMASENDAI, KAGOSHIMA PREF. 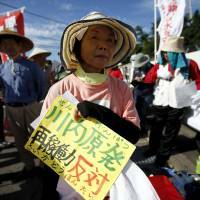 - Four years and five months to the day after the crisis began at the Fukushima No. 1 power station, Japan formally returned to nuclear power Tuesday with the restart of Kyushu Electric Power Co.’s Sendai No. 1 reactor in Kagoshima Prefecture. Despite nationwide public opposition, questions about plant safety, the practicality of disaster response plans and who will be responsible for them, the strongly pro-nuclear Prime Minister Shinzo Abe and the Ministry of Economy, Trade and Industry, as well as the politically powerful utilities, local Liberal Democratic Party politicians, and major corporations involved in the nuclear industry have pushed hard to bring as many reactors back online as possible. The nuclear lobby strongly argues that atomic power is cheaper than importing oil or coal and will help curb greenhouse gas emissions. With the restart of the Sendai No. 1 reactor, the first under the new safety inspection regime that went into effect two years ago, attention has now turned to whether there will be a rush to restart other reactors. In addition to reactor No. 2 at the Sendai plant, which is expected to be brought back online in early or mid-October, another 23 reactors at 14 plants are under consideration to restart. Three of these, including the No. 3 and No. 4 reactors at Kansai Electric Power Co.’s Takahama facility in Fukui Prefecture and reactor 3 at Chugoku Electric Power Co.’s Ikata plant in Ehime Prefecture, have been given the green light for restart by the Nuclear Regulatory Authority (NRA). 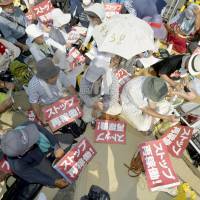 However, the two Takahama reactors have a provisional injunction against their restart slapped on them by the Fukui District Court in April, thereby making their fate uncertain. On Tuesday morning, workers at the two-reactor Sendai plant in the city of Satsumasendai pulled out the control rods that have been suppressing nuclear fission in reactor 1 for the first time since May 2011, when it was taken offline for mandatory regular checks. The reactor was expected to reach criticality within half a day, and the utility plans to start generating and delivering electricity in three days. The reactor will have a test run for about a month, and if no problems are encountered, Kyushu Electric Power will begin selling the nuclear-generated electricity in mid-September. At about the same time, final preparations will begin for a restart at the plant’s No. 2 reactor, which is expected to occur in early or mid-October, with electricity from that reactor being sold by mid-November. “The Abe administration, under its basic energy plan, has already decided it will activate reactors that have cleared new nuclear safety standards by the NRA, which are the toughest in the world. It’s under this policy that the Sendai reactor was restarted,” ﻿﻿ Chief Cabinet Secretary Yoshihide Suga said Tuesday morning. Local communities like Satsumasendai, and the pro-nuclear local chapters of the Liberal Democratic Party, also rely heavily on central government subsidies and utility donations that come with hosting a plant. 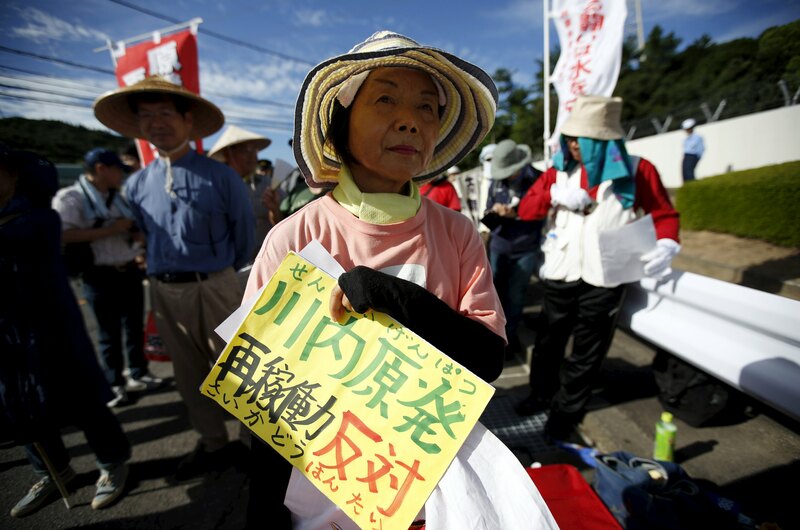 The restart of the Sendai reactor thus marks a major victory for nuclear proponents at not only the national level but in other localities looking to restart another two dozen reactors. At a news conference in the afternoon, Satsumasendai Mayor Hideo Iwakiri welcomed the restart, saying he believes the plant’s reactors are safe and that he hopes they will provide a much-needed financial and economic boost. “Between 5 and 6 percent of the town budget comes from central government funding for hosting a nuclear power plant or from Kyushu Electric,” Iwakiri said. Tuesday’s restart came despite local concerns about what will happen if an accident occurs and, most importantly, who bears responsibility for the orderly and timely evacuation within 30 km of the plant. 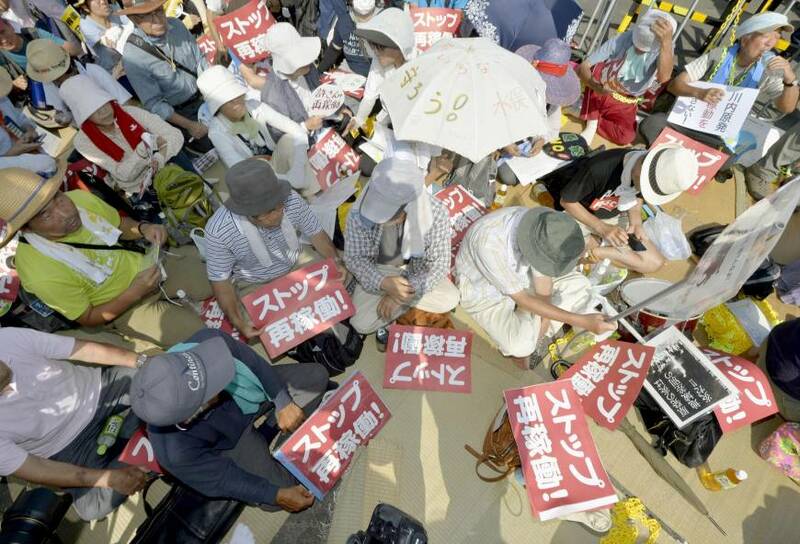 “The premise of evacuation plans drawn up by Kagoshima assumes that the main access road in the area will not be damaged and will be available to get people out of the contaminated area before they are exposed to radiation. If that’s the case, what happens?” asks Shoji Takagi, a manga artist and anti-nuclear activist. The question of where final responsibility lies for the overall safety of the plant’s operation, including proper safety measures, has emerged as the key issue in the debate over not only Sendai but all possible restarts. Local officials say they grant permission for restarts based on the “central government’s” seal of approval but admit they also need direction from Tokyo to draw up more detailed and effective accident contingency plans. The NRA, however, says it is only responsible for the technical aspects of the safety of each plant. Yukio Edano, secretary-general of the Democratic Party of Japan, the nation’s largest opposition force, said that while the local governments have been tasked with drawing up and carrying out emergency evacuation programs, the roles of the central government have not been spelled out. “(The Fukushima crisis) has made it clear that it is impossible for local governments alone to (evacuate residents). The central government should play responsible roles to evacuate them,” Edano said. “But the state is trying to evade that responsibility,” he added. In an attempt to quell lingering concerns, industry minister Yoichi Miyazawa said Tuesday that in the event of an accident, the central government will take the lead in responding to any emergency. However, with nearly two dozen reactors elsewhere up for restart, both the central government and local authorities who want the money that comes with restarts are likely to find that demands to address these concerns in more detail are not going away.